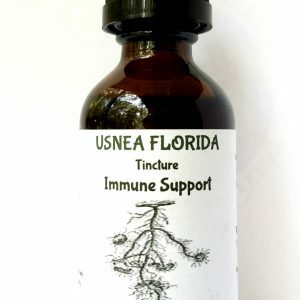 Research has discovered that the Usnea lichen kills harmful bacteria found in the digestive tract and that it is extremely beneficial to humans because it does not kill all kinds of bacteria and may leave the bacteria that are useful to the digestive tract unharmed. 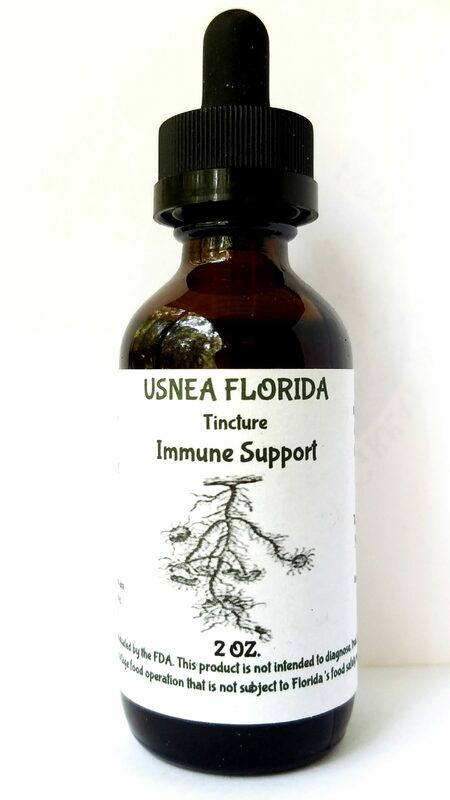 Regularly taking Usnea Tincture helps in clearing a wide range of viruses from the bronchial area and the lungs. Usnea is a fantastic choice for wounds. Using Usnea lichen in wounds can help treat or prevent infection. 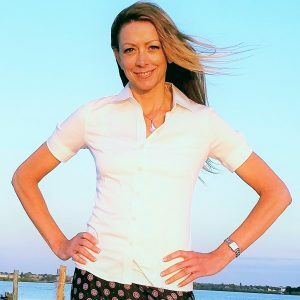 It also has wound-healing abilities that can accelerate the healing process. To use Usnea on a wound you might try it as a powdered herb or, if the wound is not infected, as a salve. Do not apply tinctures to open wounds. 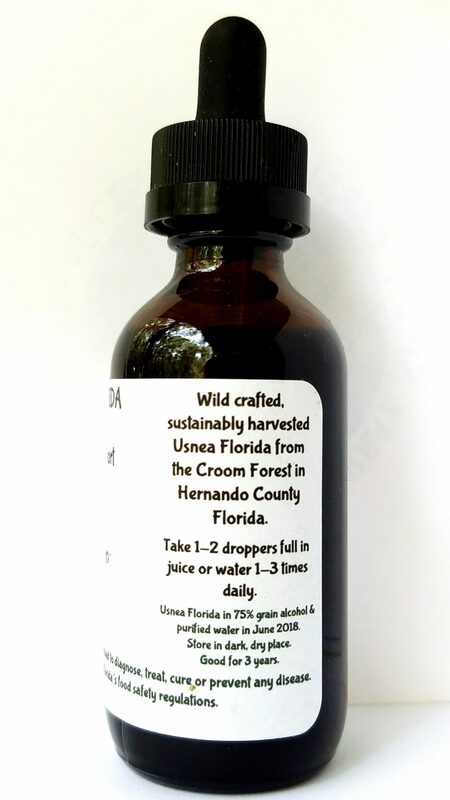 In addition to tincture form, we offer whole Usnea Florida lichen, wild harvested from our pristine forest in Brooksville. Usnea will not grow where there is air pollution. Due to its bitter taste, Usnea encourages digestion and was historically used by herbalists to treat indigestion. It is used as part of herbal cancer therapy, particularly for cases of thyroid cancers in China. 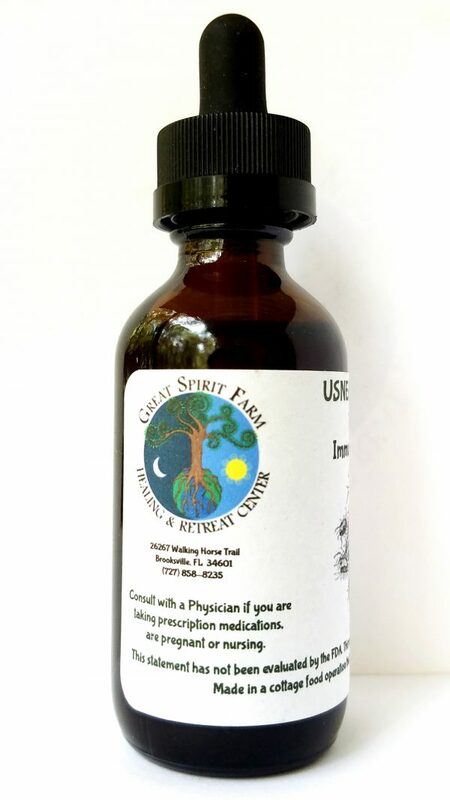 It has been used traditionally for treating headaches, ocular irritation, malaria, scrofula, leukorrhea, bleeding, carbuncle and toxic snake bite. It should not be used for more than three weeks. Avoid during Pregnancy and breast feeding. It may cause Gastrointestinal Disorders. It is recommended that you use it cautiously while applying the herb to the skin directly. Direct application of the herb on the skin may result in allergic contact dermatitis. Usnea contains some chemicals that might harm the liver. If you have liver disease, don’t take Usnea by mouth.